G.Skill has announced its new 32 GB “Double Capacity” memory modules. 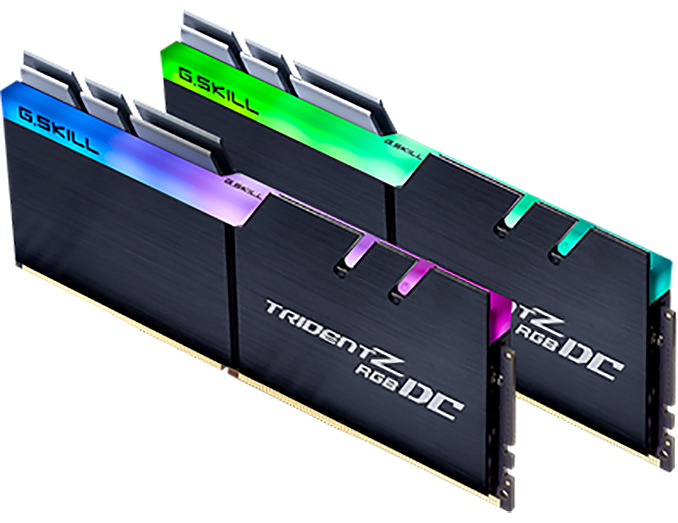 The Trident Z RGB DC DIMMs are compatible only with select Z390 motherboards from ASUS, and while they do not feature extreme data transfer rates, those who need a lot of memory this is hardly a limitation. 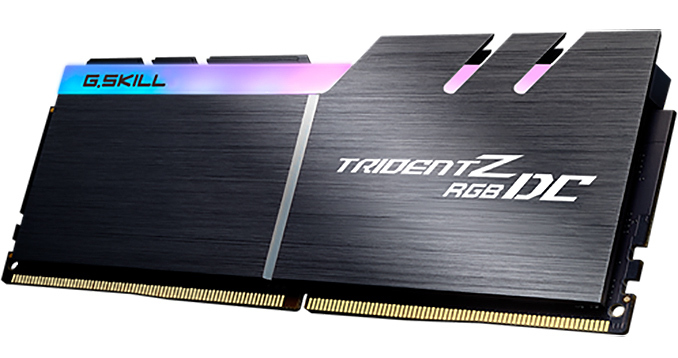 The G.Skill Trident Z RGB DC memory modules are based on 32 Samsung B-die 8 Gb DRAM devices. In fact, the manufacturer says that the “Double Capacity” DIMMs are essentially two modules on one PCB: they feature not only two times the usual number of memory chips, but they also have two EEPROMs/SPDs, etc. Meanwhile, the new UDIMMs feature a slightly different pinout and layout than JEDEC-standardized modules, so they are compatible only with ASUS's ROG Z390 MAXIMUS XI APEX, ROG Maximus XI Gene, and ROG STRIX Z390-I GAMING motherboards. G.Skill’s 32 GB Trident Z RGB DC UDIMMs will ship in dual-channel 64 GB kits rated for DDR4-3000 (CL14) and DDR4-3200 (CL14) speeds at 1.35 V. The modules fully support XMP 2.0 SPD profiles for simplified overclocking. Speaking of overclocking, it is necessary to note that Samsung’s B-die DRAMs are the widely considered the best memory chips for overclocking, so the odds are fair that the modules will be able to work at higher data rates when in good hands. Just like other Trident Z RGB DIMMs, the “Double Capacity” modules come with aluminum heat spreaders outfitted with addressable RGB light bars. The new unbuffered 32 GB Trident Z RGB DC memory modules will be available shortly. Considering that these are unique UDIMMs compatible only with a small number of motherboards, expect these products to carry a premium price tag. "Meanwhile, the new UDIMMs feature a slightly different pinout and layout than JEDEC-standardized modules, so they are compatible only with ASUS's ROG Z390 MAXIMUS XI APEX, ROG Maximus XI Gene, and ROG STRIX Z390-I GAMING motherboards."